Update 12/2016: Redsea has seen a lot of development since this post was written; see Redsea 0.7, a lightweight RDS decoder. redsea is a command-line RDS decoder. 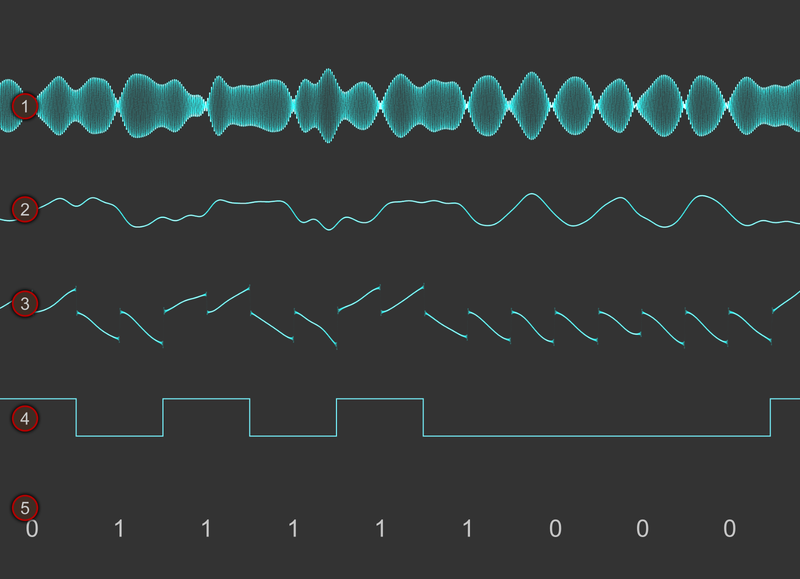 I originally wrote it as a script to decode RDS from demultiplexed FM stereo sound. Later I've experimented with other ways to read the bits, and the latest addition is to support the RTL-SDR television receiver via the rtl_fm tool. Redsea is on GitHub. It has minimal dependencies (perl core modules, C standard library, rtl-sdr command-line tools) and has been tested to work on OSX and Linux with good enough FM reception. All test results, ideas, and pull requests are welcome. The program prints out decoded RDS groups, one group per line. Each group will contain a PI code identifying the station plus varying other data, depending on the group type. The below picture explains the types of data you'll probably most often encounter. A more verbose output can be enabled with the -l option (it contains the same information though). The -t option prefixes all groups with an ISO timestamp. 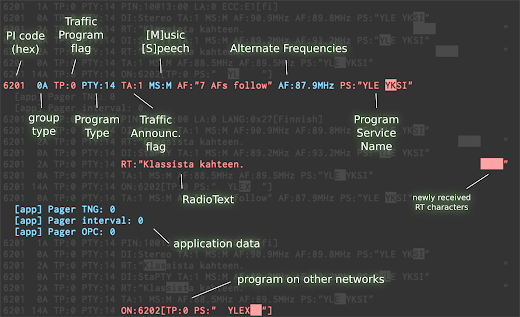 The DSP side of my program, named rtl_redsea, is written in C99. It's a synchronous DBPSK receiver that first bandpass filters ① the multiplex signal. A PLL locks onto the 19 kHz stereo pilot tone; its third harmonic (57 kHz) is used to regenerate the RDS subcarrier. Dividing it by 16 also gives us the 1187.5 Hz clock frequency. Phase offsets of these derived signals are adjusted separately. The local 57 kHz carrier is synchronized so that the constellation lines up on the real axis, so we can work on the real part only ②. Biphase symbols are multiplied by the square-wave clock and integrated ③ over a clock period, and then dumped into a delta decoder ④, which outputs the binary data as bit strings into stdout ⑤. Signal quality is estimated a couple of times per second by counting the number of "suspicious" integrated biphase symbols, i.e. symbols with halves of opposite signs. The symbols are being sampled with a 180° phase shift as well, and we can switch to that stream if it seems to produce better results. This low-throughput binary string data is then handled by redsea.pl via a pipe. Synchronization and error detection/correction happens there, as well as decoding. Group data is then displayed on the terminal, in semi-human-readable form. My ultimate goal is to have a tool useful for FM DX, i.e. pretty good noise resistance. You do know about the existence of GnuRadio, right? Yes, I know about the existence of GNU Radio. GNU Radio works fine with rtl-sdr hardware. The GNU Radio conference gave them to attendees last year to help people get started with GNU Radio. It was good post/project before the stunning gfx. 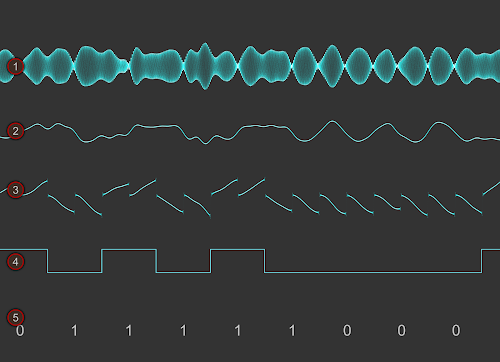 However, your waveform picture are always a treat; I had to come back. Thanks for writing. very good! I search a project for auto-log (for example in file text or csv) all picode and ps in fm band by scannering 87.50-108.00. Hello, i really like the content of your blog. One post on your blog is more interesting than 90% of the web content. I haven't (yet) received my rtl-sdr. If one day you have free time , can you post a raw sample of FM + RDS at baseband ? I know it's big, I do not want you if you can not. I would expect my rtl- sdr at the end of the month. Sorry for bad english, google trad is my unique friend. but I don't see any decoding nor error messages. the latest. Do you have any suggestions? The noise tolerance could be better. Is this a mono station? Hi, I tested two clear and strong FM stations in Germany. I tested the whole range of gains. I tested this with LNA and without. I am running Ubuntu 14.04 LTS 32 bit and using a 7 year old Lenovo T60. Other RTLSDR applications, such as ACARS, ADSB, GQRX are running well. Hi, after a bunch of software updates redsea now runs beautifully on the same system. I am impressed . Well done. Hi, Oona, nice article and blog! I'd like to get one of those RTL receivers, but there are a lot of different models and I'm somewhat confused. Could you give me some advice? I just want it to be linux compatible and with good enough reception. There are some lists online, for instance on r/RTLSDR. Hello, can you explain the recent changes (and why did you make them) to the pll loop filter ? My method of loop filter design is currently "design by herp derp" - I don't have any design tools, I just keep trying nearly every possible option. Almost. -F 9 seems to be a better filter than -F 0. Thank you, i was just curious about global pll behaviour when tuning filter loop characteristics. I am running Ubuntu 14.04 LTS 64 bit. Other RTLSDR applications, such as ADS-B, GQRX are running well. But redsea return no RDS data. Any idea? With all this recent meteor shower activity, what's your thoughts on using rtlsdr in conjunction with redsea to pick up RDS from meteor scatter? My thoughts are, as standard, rtl sdr dongles might not be sensitive enough, and there might not be enough time for your software to "lock on" to the signal. On top of that, the noise resistance of redsea is pretty bad. Great project. I just tested it on a little netbook (dell mini 1018) with a rtl-sdr usb dongle... On debian 8.2. A few hints for those trying to figure out the code: It's worth mentioning that the code no longer matches the description above - in particular, the pilot tone stuff has been removed. Also, the subcarrier filter has been changed and no longer matches the mkfilter command line given in the code - the order is now 2 not 10. Thanks, very useful insight! I struggle(d) with PLL filters and the ones used here are not based on any thorough planning, to be honest. I'm writing a new version of redsea so I will take this into account. I have a problem. I am using ubuntu 14.04 and I think that your redsea decoder could solved that without 2 much complicating with GNU radio: I would like to scan fm airband and from couple of captured stations I want to parse only radiotext group (one completed line per station), and then simultaneously by some database such as couchDB (apache) or maybe would be better RDBMS(Relational Database Management System) to store radiotext. And I have no idea how to start with even one single simple entry of radiotext being stored into database. Any kind of advice would bring me a lot of happiness, since I have very little of programming skill. printf(",\"radiotext\":\"%s\"",rt_.getLastCompleteStringTrimmed().c_str());} -- but i don't know where to put it and if does it make any sence or how to modify the script to do that. i get the all information almost immediately. And now I am confused as you also i suppose. I write too much and complicate. Forgive me. I just like app pretty much, not gonna lie, very simple and useful for my purpose. So I am asking to help me please. Hope i was enough exact with my explanation to understand me, other wise please let me put this problem in another way that you will definitely understand. Yes, redsea is sensitive to noise. This is a known issue, and any ideas are welcome: https://github.com/windytan/redsea/issues/30. More about the recent versions in this blog post. By the way, I've never actually received a station that uses 2B groups. If you do receive a good signal at some point it'd be interesting to see a minute or two's worth of output using the -x flag. So how can I help myself, any idea very please? 1. Tune to a frequency that transmits 0B and 2B groups. 2. Start redsea with the -x switch. 3. Let it run for a minute or two. 4. Copy and paste the output to pastebin. 5. Write the pastebin link here, in the comments section. This way I have some example data to work on. I don't have any test data on 0B and 2B groups, as I told above. 0B and 2B groups are not very common, and I don't have any test data to work on. Redsea already has support for 0B and 2B groups, but if it seems not be working, I need some test data. 0B should be decoded as "KRKA" and 2B should be decoded as "PRIJETNO POSLUSANJE RADIA KRKA" (and by the way as I said it always the same name for radiotext if that matters anything). Thanks, very valuable data. I've fixed this issue now; the current version on GitHub correctly decodes group 2B radiotext. Yesterday I was so ethusiastic I haven't checked the ps at all, when I saw the radiotext, so later I just realized I was thinking: "Oh shoosh I really need this important data of station name, so I got scared and thinking about it, if you had so much work to work on all that source code (which I can imagine) or did you forgot". Today I woke up and after the breakfast I just wanted to bother you with my annoyance, and just check out your site and I've seen that you just updated "25minutes ago" and I just switch state of mind from the being too concerned into ecstasy again hehe :) Thank you again Oona, It means a lot to me. It will serve very efficiently. I'll keep you post it. You made my day again :) Thank you, once again. So glad you've found it useful :) No need to be scared, I like writing code. and by the way, what do you mean exactly with "-x flag" which one to be exact? Remember to replace 87.9M with the frequency that transmits 0B and 2B groups. I'm trying to modify the original visual studio source code of "Theremino SDR" program because I need for a new application to decode not only PI , PS and radio text. I need to visualize and to put in a text box AF and to visualize the BER % of rds signal. Can you gently help me for this add? Theremino SDR has a RDS decoder but it has no AF and no BER. I need this because I need to use this in car as a carputer radio.